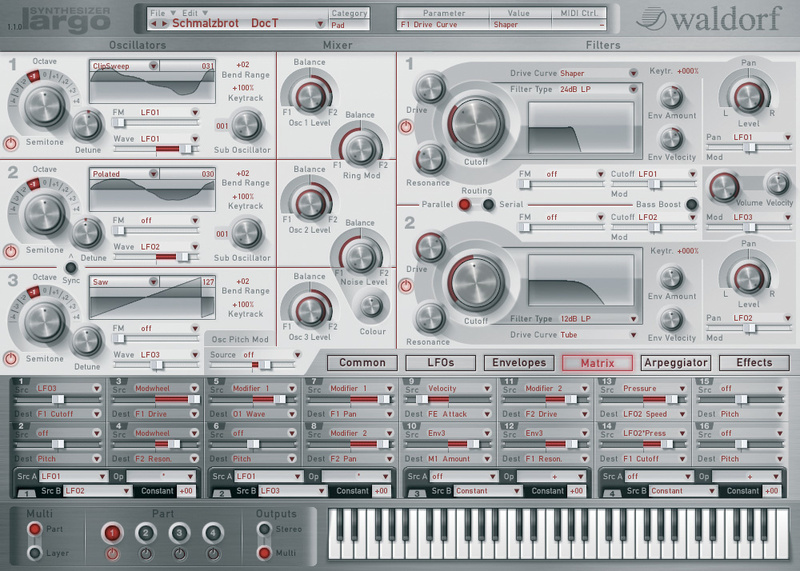 Waldorf continue their Bond theme with their first software synth, Largo. 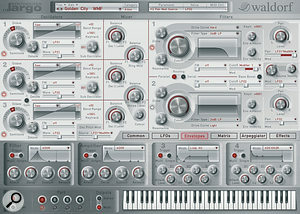 Largo is based on Waldorf's Blofeld hardware synth and, as such, is a fairly typical virtual analogue design. There are three main oscillators, two sub‑oscillators and a noise source, two multi‑mode filters, three LFOs, four envelopes and a 16‑slot modulation matrix, as well as a selection of effects. All of this forms a 'layer', and up to four layers can be combined into a sound, each layer having its own arpeggiator. This is pretty standard stuff, but there are a few tricks up the Largo's virtual sleeve, as we'll see. Largo works as a VST and Audio Units plug‑in, and minimum system requirements are, er, minimal, with just an 800MHz processor and 64MB RAM required to get going. Obviously, more will be better if you have it, but then these days most of us do. Installation is simple, and authorisation is done via the well known Syncrosoft system. Once the license has been downloaded to your computer or Syncrosoft dongle, you're ready to get stuck in! 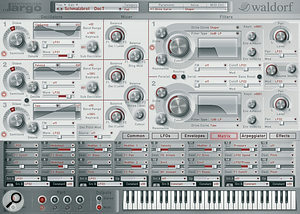 Waldorf are famous for their wavetable synthesis, and Largo incorporates it as fully as you would expect. In addition to the standard sawtooth, square, pulse, triangle and sine waves, Oscillators 1 and 2 also have a selection of 64 wavetables to choose from, and both feature dedicated sub‑oscillators. Oscillator 3 has just the standard collection of pulse, saw, triangle and sine waves. All three oscillators have an FM input with a number of modulation source choices, as well as a Wave control function that steps through the wavetable when modulated. Finally, Oscillators 2 and 3 also have a Sync option. In the Mixer section, there are controls for each oscillator's level and separate controls for Ring Modulation and Noise levels. Each level control also has an associated balance knob, which can be used to route each source to either Filter 1, Filter 2 or a mixture of both. The two filters are identical and each one has a selection of filter types, which includes 12dB and 24dB variants of low‑pass, high‑pass and band‑pass, as well as both positive and negative comb filters. These filters can be used in both series and parallel configurations and their outputs can be independently panned. All the usual filter parameters are present, and each filter also includes a Drive control. This is basically a saturation circuit with eight different options for drive type, ranging from more traditional tube emulations to fuzz and waveshaper circuits. On envelopes 3 and 4 you can see examples of the more esoteric envelope types available in Largo, including the looping envelope type on envelope 3. 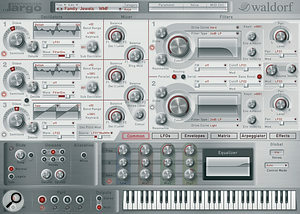 At the bottom of the synth window are six tabs for accessing Largo's modulation and effects parameters. This is a common system for giving software synths a clean and compact layout, at the (minimal) expense of having to click tabs to access different parameters. First up, the Common tab includes controls for Glide (portamento), Unison (with options for the number of unison voices, as well as detuning and spread controls), Allocation (mono or polyphonic), a four‑band fully parametric equaliser and a control to determine the number of voices. Next we have the LFO tab, and this is where we find controls for Largo's three LFOs. They are, for the most part, identical and offer a selection of LFO waveforms as well as controls for MIDI clock sync, speed, delay, fade and LFO phase, which is continuously variable from zero to 360 degrees. LFO 3 has one more option, though: a 'Step' waveform and associated contour control. The Step waveform is fundamentally a step sequencer with up to 16 steps. For each step you can specify (by clicking and dragging) a level, which can be either positive or negative, and the sharpness of the steps can be smoothed via to the contour amount setting. An unusual and very welcome addition, I think! Under the Envelopes tab, we find four identical envelopes. Envelope 1 is always hard‑wired to the filter and Envelope 2 is for amplitude, but they can also be used to modulate other parameters at the same time. Envelopes 3 and 4 are always free. Each envelope has options for single triggering and multi‑triggering and five selectable envelope types: a basic ADSR envelope, an ADS1DS2R envelope, a 'one shot' envelope and two different 'looping' envelopes. This gives you a lot of freedom, and is something that marks Largo out as a little bit special, in my opinion. Clicking on the Matrix tab reveals the modulation matrix. There are 16 'slots' and each has a modulation source, a modulation destination, and a slider to control the amount of modulation (both positive and negative). This is, of course, in addition to any controls on the main synth window for the more common parameter mappings. No surprises when you click on the Arpeggiator tab. All the usual functions are here: a Clock parameter that determines the timing grid of each of the (up to) 16 steps of the arpeggio, a length parameter that changes the duration of each step, a direction control (with up, down, alternate up and alternate down directions), and octave range, which in this case is up to 10 octaves! While this is a nice addition, arpeggiators have come a long way in recent years, and I can't help but feel that Largo's is a little under-powered, given the spec of the rest of the synth. To make things a little more interesting, though, there are 15 pre‑programmed patterns, along with a user pattern that allows you to set timing, duration and accent (velocity offset) for each of the 16 steps. Finally, and very usefully, there is a Timing Factor knob, which basically adds a degree of swing to the arpeggiator... Nice! The final tab is for the effects section. While there isn't a huge variety of effects to choose from, there are two effects slots, the first of which can be either a chorus, flanger, phaser or overdrive, and the second of which has all of these options, plus delay and reverb. Each effect slot has an on/off switch and a wet/dry knob. The controls for each effect are pretty much what you would expect, without being overly complicated. As mentioned earlier, Largo also allows up to four layers per patch. The Part buttons at the very bottom of the window allow you to switch on or off up to four layers of sound, and clicking on the numbered buttons for each part displays the settings for that layer in the main window. This is something new to me in a virtual analogue synth! The 16 slots in the Matrix tab allow a great deal of movement and life to be programmed into sounds. Regardless of how many options for sound creation it has, a soft synth lives or dies by the end results. Having all the modulation and control options in the world won't make a synth a success if the basic sound doesn't measure up. Fortunately, Largo's does. And then some! Just browsing through the presets gives you an idea of the flexibility of the synth, with sounds ranging from glossy and rich analogue‑style pads through solid and thumping basses, to more esoteric, almost FM‑like bells and chimes and, finally, on to all manner of grungy and dirty sounds. If you listen carefully, you really can hear the wavetable oscillators at work in a lot of the patches. Even those sounds that seem to be quite traditional have a lot of subtle timbral movement, which comes not from the filtering but from the oscillators themselves. The extensive modulation options could be used to create some truly epic, evolving sounds but you won't find too many of these in the presets. Maybe it's a good thing as it will no doubt inspire you to try things out for yourself, to see what Largo is really capable of. The effects are a nice add‑on, as they can be integrated into the patches but, to be honest, I would probably add the effects myself using other plug‑ins, as the ones in Largo are perhaps not the best or most flexible I have come across. When I started listening to the individual parts of Largo in isolation, it quickly became obvious that it had been designed and coded by a very mature company that has a lot of experience in synth design. The oscillators themselves, apart from their inherent flexibility, just sound great! Comparing them to a few other soft synths led me to feel that Waldorf have really done their homework here, as the oscillators sound just as good and 'analogue' as any of the other soft synths that I compared it to, even my personal favourite for analogue flavour, the Korg Legacy Collection. The filters, too, have that certain something that just makes you believe that you could be listening to a real hardware synth and not a plug‑in. I think that they sound their best when being driven slightly — this seems to give them even more character. the tools for creating some very interesting and unique sounds. The oscillators are, for me, the stars of the show. The harmonic complexity and the movement of the wavetables really does add something to the normal virtual analogue sound palette. The filter drive section is also particularly nice for adding a bit of filth to the sound, and in a way that is somehow different to applying distortion or overdrive to the output of the synth — it somehow seems more organic. CPU usage seemed very reasonable, considering the level of complexity you are dealing with, and looked comparable to my Arturia Minimoog in a lot of cases. 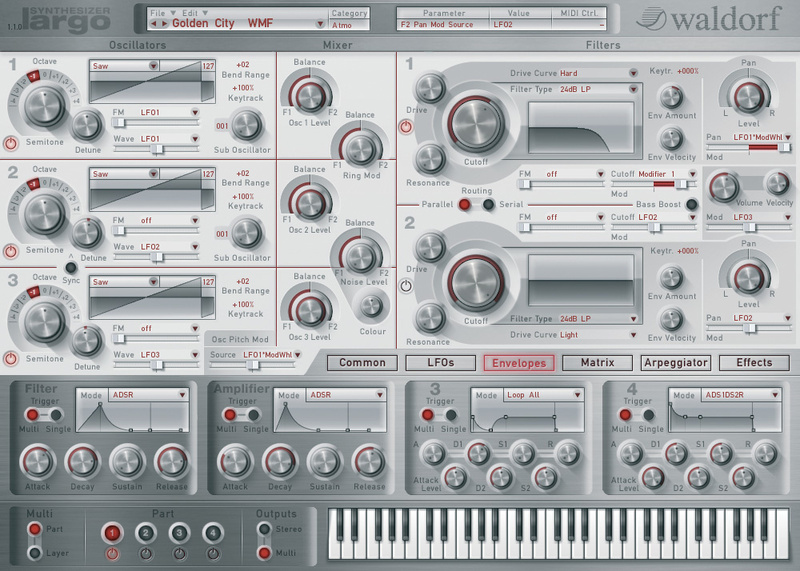 Sadly, I wasn't able to compare Largo to a Blofeld hardware synth, but, by all accounts, Waldorf have done a brilliant job of bringing the Blofeld sound and architecture to the Mac and PC platforms. The sound quality is second to none, and the balance between intuitive programming and deeper complexity is, in my opinion, just about right! Anyone considering the purchase of a virtual analogue synth is spoiled for choice these days, as there are so many options available. One of my favourites is Arturia's Minimoog V2, which offers a lot of the depth and character that Largo does, albeit with a simpler modulation architecture. Korg's Legacy Collection Analogue Edition is another of my favourites for sound quality, but Cakewalk's Rapture is probably the closest direct competitor to Largo, as it provides wavetable functionality, advanced envelopes and modulation routings, and a similar degree of sonic variety in its sounds. Oscillators and filters sound fabulous! Plenty of modulation and editing options. Up to four layers in a single patch. The arpeggiator could have benefited from a few more options. The Effects section is a little underwhelming. While not revolutionary, Largo does offer fantastic sound quality and a great deal of programmability in a well-thought-out and well‑designed package. 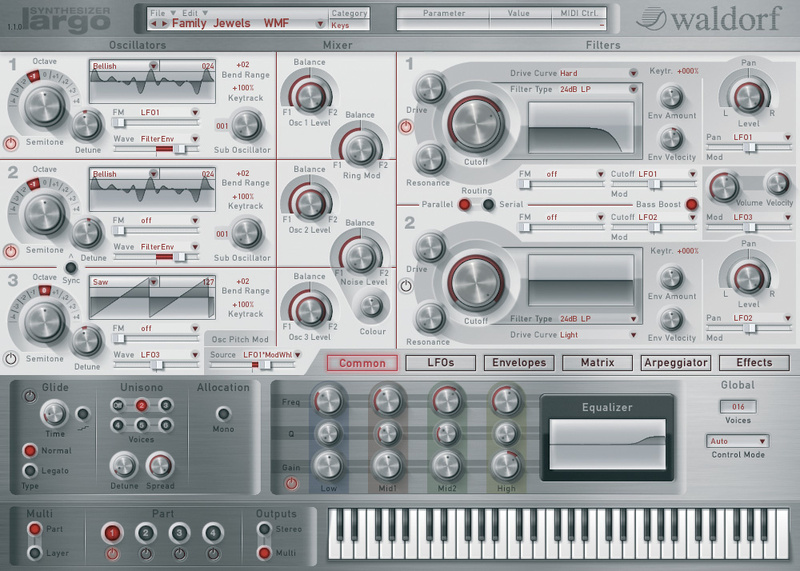 And it has that signature Waldorf wavetable sound! Hand In Hand +44 (0)1752 696633. MV Pro Audio +1 877 784 7383. Apple eight‑core Mac Pro (3GHz Xeon 5400 series), 10GB RAM, OS 10.4.11.